Composites shipments in the global rail market is expected to grow to $876 million in 2019. The major drivers for composites in the global rail market are lower cost over the lifetime of the parts, FST properties, weight reduction, high growth in high speed rail, change in technologies, fuel efficiency and operational costs, and passenger safety. 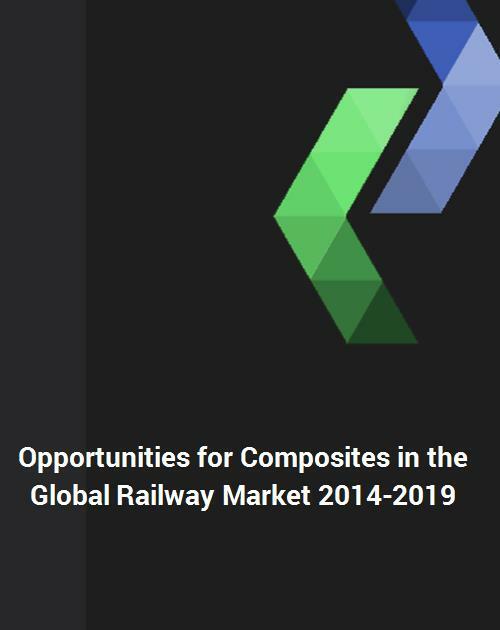 The report analyses the global rail market by segments and has come up with a comprehensive research report “Opportunities for Composites in the Global Railway Market 2014–2019.” This report provides an analysis of the global rail market including an analysis of market trends, competitive landscapes, company profiles, emerging trends, and key drivers of industry growth. The study also includes the trends and forecasts for the global rail market through 2019, segmented by type of resins and reinforcements, manufacturing processes as well as by regions which are listed below. On the basis of its comprehensive research, the report forecasts that the global rail composites will grow moderately during 2014-2019. Bombardier, Alstom, Siemens, GE, China CSR, China CNR are among the major rail manufacturers. Regular innovation of the products is very important for companies to sustain their successful positions in the market. - Global and regional analysis of rail market. The market size and growth rates of the rail market in Europe, North America and Asia with Rest of world. - Composite materials consumption in the global rail market. Market break down by different types of resins and fibers. 8.2.35. Haysite Reinforced Plastics Co.
- Haysite Reinforced Plastics Co.